This antibody recognizes the Stalk Region of both long isoforms of Fibroblast activation protein, alpha but does not recognize other DPP family members. Synthetic peptide within Human Fibroblast activation protein, alpha. The exact sequence is proprietary. Our Abpromise guarantee covers the use of ab28244 in the following tested applications. WB 1/1000 - 1/5000. Detects a band of approximately 110-120 kDa (predicted molecular weight: 88 kDa). 1/1000 when using colorimetric substrates such as BCIP/NBT - 1/5000 when using chemiluminescent substrates. Note: EDTA/EGTA treatment of tissues or lysates is required to see latent zymogen. Dilution optimised using Chromogenic detection. In association with DPP4 is involved in the pericellular proteolysis of the extracellular matrix (ECM), the migration and invasion of endothelial cells into the ECM. May have a role in tissue remodeling during development and wound healing, and may contribute to invasiveness in malignant cancers. Belongs to the peptidase S9B family. The N-terminus may be blocked. Cell membrane. Cell projection > lamellipodium membrane. Cell projection > invadopodium membrane. Found in cell surface lamellipodia, invadopodia and on shed vesicles. Colocalized with DPP4 in invadopodia and lamellipodia of migratory activated endothelial cells in collagenous matrix. Colocalized with DPP4 on endothelial cells of capillary-like microvessels but not large vessels within invasive breast ductal carcinoma. ICC/IF image of ab28244 stained MEF1 cells. The cells were 4% PFA fixed (10 min) and then incubated in 1%BSA / 10% normal goat serum / 0.3M glycine in 0.1% PBS-Tween for 1h to permeabilise the cells and block non-specific protein-protein interactions. The cells were then incubated with the antibody (ab28244, 1µg/ml) overnight at +4°C. The secondary antibody (green) was Alexa Fluor® 488 goat anti-rabbit IgG (H+L) used at a 1/1000 dilution for 1h. Alexa Fluor® 594 WGA was used to label plasma membranes (red) at a 1/200 dilution for 1h. DAPI was used to stain the cell nuclei (blue) at a concentration of 1.43µM. Publishing research using ab28244? Please let us know so that we can cite the reference in this datasheet. Phone call reporting problems in using the Anti-Fibroblast activation protein, alpha antibody - Stalk region (ab28244) in IHC-P with human liver tissue. As we discussed on the phone, I would like to collect a few more details from you in regards to the samples and protocol used with the antibody. To this end, I have attached aquestionnaire. This should only take 5-10 minutes to complete and if you could include any images of the staining that would be very helpful. OnceI havereceive the completed questionnaire,I will look at the protocol and see if there are any suggestionsI can make that may improve the results. This information will also allow us to investigate this case internally and initiate additional testing where necessary. Hi, I want to buy Fibroblast activation protein antibody, and I saw there are 4 products on your website. Ab28243 Catalytic domain Ab28246 Catalytic insert Ab28245 Spacer Ab28244 Stalk I want to do immunofluorescence in rat fibroblast to see if my treatment can activate fibroblast or not. I want to use FAP as a marker for the activated fibroblast. So which antibody do you suggest? Thanks! I would recommend using ab28244 or ab28246 as each of these is guaranteed to work in IF on rat tissues under our Abpromise. The immunogen for ab28244 Fibroblast activation protein, alpha antibody starts at the beginning of the stalk region.This region starts at amino acid 30 of the 760 amino acid sequence of human FAP-alpha, and follows the transmembrane domain. Cleavage of the stalk region releases the shed form of FAP-alpha. ab28246(Fibroblast activation protein, alpha antibody - Catalytic insert) will recognize the 759 amino acid sequence of human FAP-alpha which has an insert in the catalytic domain. These products are covered by our Abpromise guarantee. If you experience any issues with these products we offer scientific support, replacement or refund under our Abpromise guarantee, for a period of 6 months from purchase, if used according to specifications listed on our datasheet. We do not know of any publications which have used this product in IHC-P in mouse tissues. A good starting point for determining the optimal concentration is to use the dilution used in the earlier referenced paper, 1:600. Of course you will need to titer out the best concentration but using this reference for your experiments will give you an excellent start. 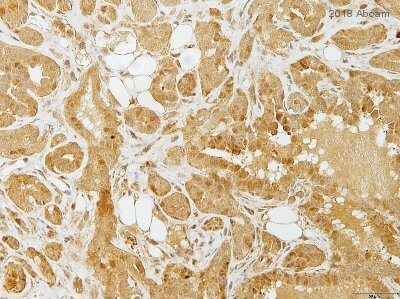 Regarding ab28244, has this antibody been tested for IHC of fixed/paraffin-embedded mouse tissue, and if so, are you able to provide any sample images and/or recommended dilution/staining conditions? I was not able to find any reference of this antibody in the literature. Thank you. Where it is referenced as Rabbit polyclonal antibody to fibroblast activation protein (FAP), α-Stalk region (Abcam, Cambridge, MA) and was used at 1:600 dilution. We are looking for an antibody to sort porcine fibroblasts by flow cytometry. Do you have any antibody that may work in pigs? Otherwise, do you offer any kind of testing sample and/or discount to try the antibody inadifferent specie other than those listed in the datasheet? The tested applications and the species are normally listed on the on-line product datasheets. Generally, we test our antibodies in human, mouse and rat samples - very few antibodies are characterized in specifically in porcine. However, it does not necessary mean that they are unsuitable in this species but we have no preliminary data yet to support the cross-reactivity. I have conducted a search for you and found some antibodies (ab28244, ab44971, ab51824) which recognize fibroblasts and are suitable for Flow cytometry but no cross-reactivity data with porcine so far. We can certainly offer a discount code for testings and the Terms and Conditions of this offer can be found at the following site: https://www.abcam.com/collaborationdiscount. If you are interested in any particular fibroblast markers, you may wish to conduct a search using our website and check some publications using PubMed websites. Thank you for contacting Abcam regarding ab28244. Unfortunately the immunogen information for ab28244 is considered proprietary and I do not have access to that information. Please accept my apologies for not being able to provide you with the information you required. If there is anything else I can do help you, please do not hesitate to contact me. Thank you for your reply. I can confirm that only ab28244 (Anti-Fibroblast activation protein, alpha antibody - Stalk region) is tested and guaranteed for flow cytometry and I therefore recommend this antibody for your experiments. Please find a publication that used this antibody in flow cytometry on the datasheet: datasheet=28244.https://www.abcam.com/index.html?datasheet=28244 https://www.abcam.com/index.html?datasheet=28244. The descriptive terms for these antibodies are based on comparison with the dipeptidyl peptidase family, especially DPP-4. FAP-alpha starts with a short cytoplasmic domain followed by a transmembrane domain. The stalk region, which starts at amino acid 30 of the 760 amino acid sequence of human FAP-alpha, follows the transmembrane domain and is extracellular. Cleavage of the stalk region releases the shed form of FAP-alpha. RP1-FAP-alpha (ab28244 Fibroblast activation protein, alpha antibody - Stalk region) starts at the beginning of the stalk region. This antibody recognizes the Stalk Region of both long isoforms of Fibroblast activation protein-alpha. Between the stalk region and the catalytic domain is the spacer region. RP2-FAP-alpha ab28245 (Fibroblast activation protein, alpha antibody - Spacer region) is in the middle of this spacer region, it starts shortly after amino acid 250. I hope this will be helpful to you. Please fell for to contact me again in case you have further questions. Thank you for contacting us. I can confirm that ab28244 is tested and guaranteed for FACS and IHC-P in mouse, human and rat by our Abpromise. and therefore should be suitable to isolate cells that express FAP. This antibody recognizes the Stalk Region of both long isoforms of Fibroblast activation protein-alpha. The stalk region, which starts at amino acid 30 of the 760 amino acid sequence of human FAP-alpha, follows the transmembrane domain and is extracellular. Cleavage of the stalk region releases the shed form of FAP-alpha. We have no data concerning the recognition of the cleaved FAP by ab28244. We are not specialized in the field of pancreatic stellate cells and do not know if this antibody is suitable to isolate these cells specifically. We do not want to recommend a product that may be unsuitable. We encourage customers to consult the latest literature available through PubMed and other resources in order to find the most up-to-date information about their specific research interests. I am sorry that I could not be more helpful, but I hope that the available literature in this area can provide some clarification. Please do not hesitate to contact us again with other needs or with any questions about our products.